The production of high yields of oligosaccharides of specific chain length from simple raw materials such as inulin and sucrose is a technical challenge so, the industrial production of short-chain fructooligosaccharides (FOS) is attracting the attention of researchers and business man due to the pharmaceutical importance of these compounds. FOS produced by the action of specific enzymes so called fructosyltransferases are 1-kestose (GF2), nystose (GF3) and fructofuranosyl nystose (GF4). GF3 and GF4 are prebiotics with biofunctional properties and hence health benefits if consumed in recommended dosages. This paper discuss recent research trends in the production and application of short-chain oligosaccharides and propose some process design to obtain these products industrially; also health benefits associated with prebiotics consumption are discussed. Keywords: enzymatic production; oligosaccharides; enzymes. La producción de altos rendimientos de oligosacáridos de longitud de cadena específica a partir de materias primas simples, tales como la inulina y la sacarosa es un desafío técnico así, la producción industrial de fructooligosacáridos de cadena corta (FOS) está atrayendo la atención de los investigadores y hombre de negocios debido a la importancia farmacéutica de estos compuestos. FOS producido por la acción de enzimas específicas denominadas transferasas fructosilo son 1-questosa (GF2), nistosa (GF3) y nistosa fructofuranosil (GF4). GF3 y GF4 son prebióticos con propiedades biofuncionales y por lo tanto producen beneficios a la salud si se consumen en las dosis recomendadas. En este trabajo se discuten las tendencias recientes de investigación en la producción y aplicación de los oligosacáridos de cadena corta y se propone un diseño del proceso para obtener estos productos industrialmente. Se discuten los beneficios para la salud asociados al consumo de prebióticos. Palabras clave: producción enzimática, oligosacáridos, enzimas. The industrial production of short-chain fructooligosaccharides (FOS) and inulooligosaccharides is expanding rapidly due to the pharmaceutical importance of these compounds. FOS, concisely termed prebiotics, have biofunctional properties and hence health benefits if consumed in recommended dosages. 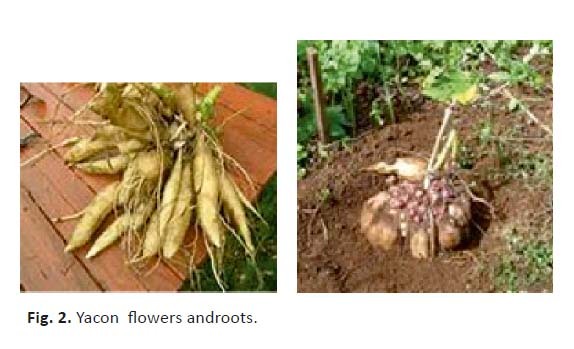 1 Prebiotics can be produced enzymatically from sucrose elongation or via enzymatic hydrolysis of inulin by exoinulinases and endoinulinases acting alone or synergistically. Fructosyltransferases act by cleaving a sucrose molecule and then transferring the liberated fructose molecule to an acceptor molecule such as sucrose or another oligosaccharide to elongate the short-chain fructooligosaccharide.2 The FOS produced by the action of fructosyltransferases are 1-kestose (GF2), nystose (GF3) and fructofuranosyl nystose (GF4) (. FOS, particularly the trisaccharide 1-kestose, are highly demanded in the functional food market due to their dual application as prebiotics and low-calorie sweeteners. 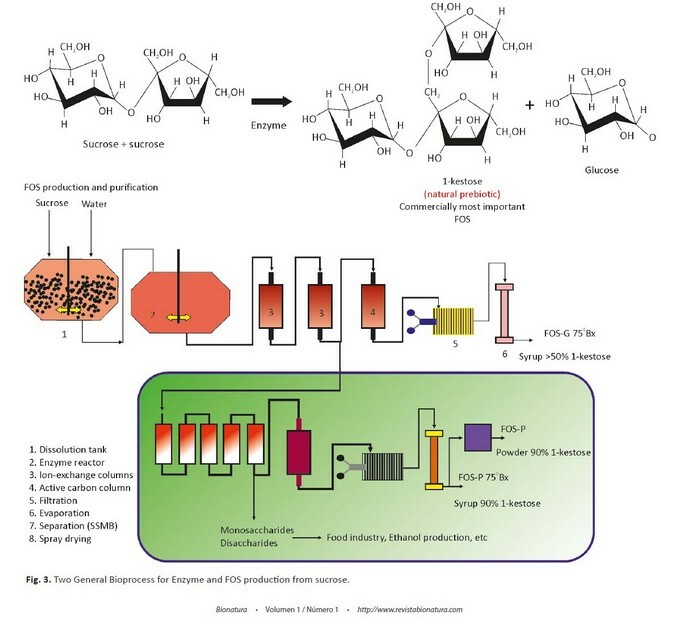 Current FOS production from sucrose using immobilized fungal fructosyltransferases is a costly process that yields limited levels of 1-kestose so, new sources of enzymes are highly desired to date. The production of high yields of oligosaccharides of specific chain length from simple raw materials such as inulin and sucrose is a technical challenge. 3 This report shows some possible bioprocess for short-chain oligosaccharidesproduction and enzyme sources for the production of these prebiotics. FOS are mainly used as an additive in functional foods. They are considered as prebiotic compounds due to their capacity to selectively stimulate the growth and/or activity of potentially health-enhancing intestinal bacteria (Lactobacillusand Bifidobacterium strains). 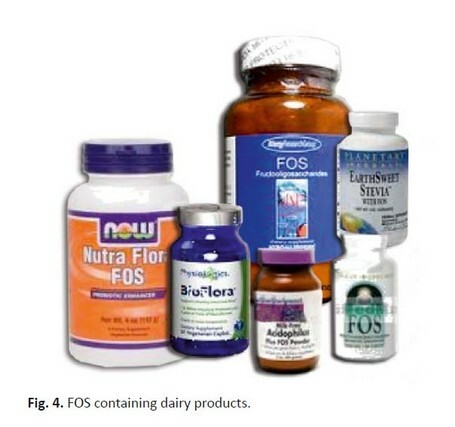 FOS has been found to fit well within the concept of dietary fiber, because they resist digestion and absorption in the stomach and small intestine of humans and animals, and affect the intestinal epithelium that may strengthen mucosal protection and reduce the risk of gastrointestinal diseases.8 The chronic ingestion of FOS has been associated with increased intestinal calcium and magnesium absorption, modification of lipid metabolism, and prevention of colon cancer. In food industry FOS are used as ingredients that contribute to enhance shelf life and taste profile. 9,10 The global market of functional foods is estimated up to US$ 33 billion. In US the prebiotics market have earned revenues of US$ 68.9 million in 2007 and will be estimates to reach US$ 198.3 million in 2014. Although in Europe the FOS market is smaller than in US, it has shown a rate growth between 10 and 20 % during the last five years, compared to a rate growth of 2 % of the whole food market. Europe prebiotic market is estimated in US$1.2 billions and this will be around US$ 1.9 billions for the year 2010. UK, Germany, and France represent the main markets for FOS-containing products commercialization, with the 63 % of the whole European market ( Figura 4). 1 Guío F, Rodríguez, MA Alméciga-Diaz CJ and Sánchez OF. Recent Patents on Food, Nutrition & Agriculture. Recent Trends in Fructooligosaccharides Production. 2009; 1(3): 221-230. 2 Yun JW. Fructooligosaccharides occurrence, preparation, and application. Enzyme Microb Tech. 1996. 19(2):107–117. 3 Mutanda TMP, Mokoena AO, Wilhelmi BS, Whiteley CG. (2014) Microbial enzymatic production and applications of shortchain fructooligosaccharides and inulooligosaccharides: recent advances and current perspectives. J Ind Microbiol Biotechnol. 2014; 41:893–906. 4 Itaya NM, Asega AF, Carvalho MAM, Figueiredo-Ribeiro RL. Hydrolase and fructosyltransferase activities implicated in the accumulation of different chain size fructans in three Asteracea species. Plant Physiol Bioch. 2007; 45:647–656. 5 Huitron C, Perez R, Gutierrez L, Lappe P, Petrosyan P, Villegas J, Aguilar C, Rocha-Zavalata L, Blancas A. Bioconversion of Agave tequilana fructans by exo-inulinase from indigenous Aspergillus niger CH-A-2010 enhances ethanol production from raw Agave tequilana juice. J Ind Microbiol Biotechnol. 2013; 40:123–132. 6 Yun JW, Kim DH, Uhm TB, Song SK. Production of high content inulo-oligosaccharides from inulin by a purified endoinulinase. Biotechnol Lett. 1997; 19(9):935–938. 7 Yun JW, Park JP, Song JP, Lee CY, Kim JH, Song SK. Continuous production of inulo-oligosaccharides from chicory juice by immobilised endoinulinase. Bioproc Biosyst Eng. 2000; 22:189–194. 8 Brownawell AM, Caers W, Gibson GR, Kendall CWC, Lewis KD, Ringel Y, Slavin JL. Prebiotics and the health benefits of fiber: current regulatory status, future research, and goals. J Nutr. 2012; 142:962–974. 9 De Sousa VMC, dos Santos EF, Sgarbieri VC. The importance of prebiotics in functional foods and clinical practice. Food Nutr Sci; 2011; 2:133–144. 10 Gualtieri KA, Guembarovski RL, Oda JMM, Fiori-Lopes L, Carneiro NK, de Castro VD, Neto JS, Watanabe MAE. 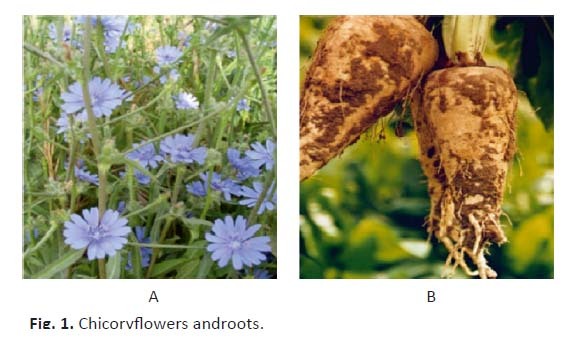 Inulin: therapeutic potential, prebiotic properties and immunological aspects. Food Agric Immunol. 2013; 24(1):21–31. Grupo de Biotecnología Industrial. Departamento de Ciencias de la Vida. Universidad de las Fuerzas Armadas (ESPE). Ecuador.